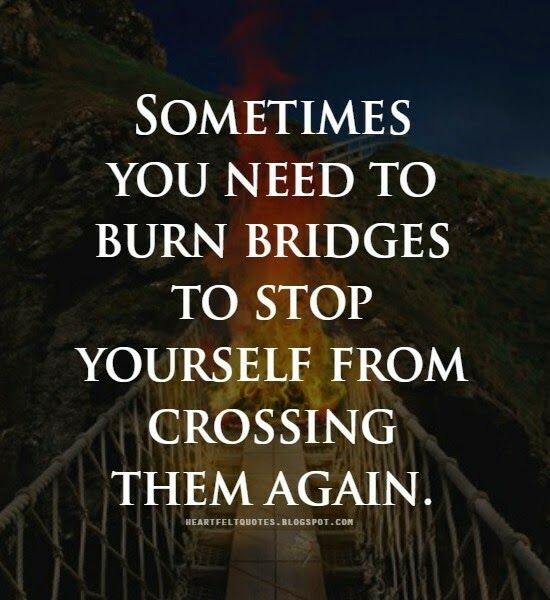 Burn some Bridges! — Nina Barlevy, Psy.D. Usually we think of burning bridges as a very drastic and negative action but in today’s Skill of the Month I hope to share with you why Burning Bridges is actually a very helpful skill. Again taken from the work of Dr. Lane Pederson, Bridge Burning is an additional DBT skill not originally part of Dr. Marsha Linehan’s model. The concept of Bridge Burning is to remove the means of acting on harmful urges or behaviors. I like to remind my clients that life is hard enough as it is. Let’s make it easier for ourselves so that doing helpful things is actually easier than doing unhelpful things. For example, I’ve many times disclosed that I have dogs not just because I love dogs but also because they make me get out of bed and walk every single morning whether I feel like it or not. Even that, sometimes, is not enough so I go one step further by sleeping in clothes that I can go out of the house wearing (yoga pants and sports bra with a t-shirt usually) so that I just have to roll out of bed and put on my shoes. I remove the excuses not to do the behavior. Conversely, Bridge Burning removes the EASE of doing things which are unhelpful urges—it is designed to make it EVEN MORE DIFFICULT to engage in behaviors which are not beneficial to your well being. Dr. Pederson gives some wonderful suggestions to burn bridges when your urge is to use alcohol and/or drugs; self-injury and/or suicidal urges; spending; and hopeless relationships. You can probably imagine many of his suggestions (not keeping alcohol/drugs in the house which makes it harder/takes longer to actually have it in your hands; removing means of self-injury from your house; cutting up or freezing in water credit cards thus making it far more difficult to use them immediately; and erasing/blocking numbers from cell phones). Dr. Pederson’s lists are excellent starting places but really mainly assist with the most unhelpful/dangerous behaviors. If you’re not struggling with any of the four areas he covers, don’t dismiss Bridge Burning as only for others! I see many clients that struggle with eating disorders, OCD, even parenting problems. We can use the same model to come up with ways to burn bridges here, too. You can try this method for just about any “bad habit” that you’re trying to “break”. Let me just take a moment here to explain how I might use Bridge Burning with parenting problems. Frequently I see kids that “act out” in some way so you might use Bridge Burning by removing the means. If they’re throwing things, remove the things. If they’re destroying property, remove the means of destruction. Now obviously this does not address the REASON why they’re acting out in harmful ways but Bridge Burning would actually be one of the first things I might suggest to the parent. After he or she is unable to do the destructive behavior, THEN you can figure out what they’re really “trying to say” in their behavior. For OCD sufferers, I’m thinking mainly of the compulsions—especially those who have the compulsion to check up on things (using apps like “find my droid” or “find friends” to see where loved ones are or using the phone to “confess” their “sins” to others) we might delete apps or limit phone usage thereby Burning the Bridge to acting on the compulsion as easily. Remember to include in your list at least one “replacement behavior” because many times our urges come when we’re feeling lonely or bored. If we can address those feelings instead of doing the urge behavior, we are going to be much more successful in the long run. Some suggestions for alternative behaviors include: calling a supportive friend, sponsor, or therapist to share your struggle; journaling; taking a walk (away from sources to purchase new items for urges! ); watch a funny/entertaining video or show; read an engaging novel or take a trip to the local library to find a new book or two. Many people trying to quit smoking have found that taking up knitting or crochet gives them something to do with their hands! Bridge burning will be most helpful to you if you’re also using skillful behavior such as Opposite Action, working a 12-step program, using distress tolerance skills like Contribute or Imagery; or engaging in mindfulness or meditation. These skills can be part of your replacement behaviors list. As you can see, it is important to remember the Bridge Burning will not actually address the underlying behavior that you are trying to change. It is only a part of how we can help ourselves change our behavior to healthier, more appropriate choices. It forces you to have to do more to act on the urge. It builds time in to the pattern to give you more opportunities to slow down and make another choice. It is a good idea to spend some time thinking about Bridge Burning and use it to assist yourself in making healthier choices when it comes to acting on urges.